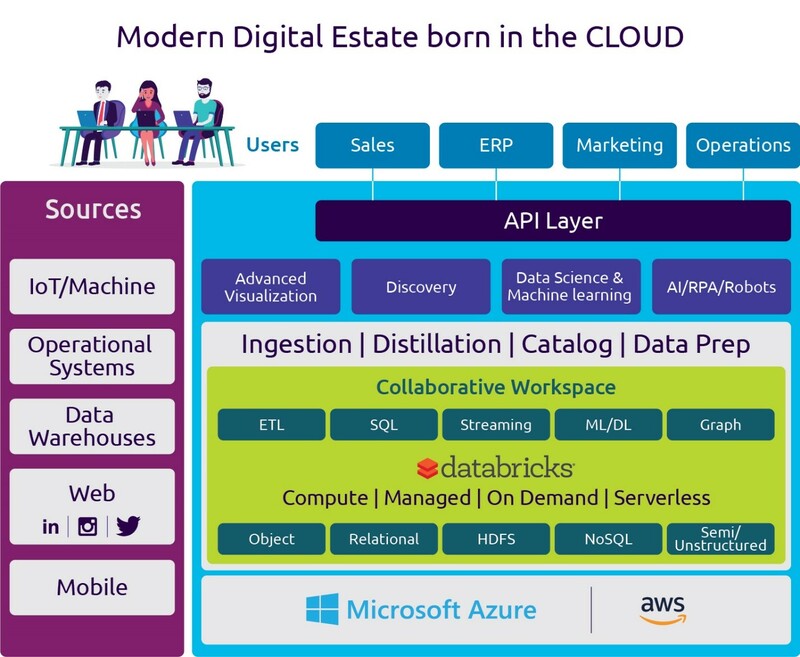 What is the Modern Digital Estate for AI and how can it work for your enterprise? AI has enormous promise – driving disruptive innovation in every industry. Leaders will embrace AI and drastically change how they interact with their customers, their suppliers, their employees, and the world around them. We believe that the hardest decision leaders will have to make will be cultural and internal to their organization. Changing what they believe is important for them to accomplish their goals. Leaders will transform sectors to be digitally driven based on a clear view of the business they need to create. Those that try to compete based on old thinking will cease to be viable. For most companies, the challenge will be how not to fall in the middle, trapped between the innovators and the doomed. The risk for these firms is that they will tread water in the short term by applying “digital lipstick.” They will protect existing business lines through cost cutting or tactical automation; they will pay lip service to new business models while preserving legacy tactics, burying their head in the sand, trying to hide from this disruption. Most telling of those in the middle will be their fear of breaking internal center of power or silos. They will fail to lay down a digital vision for their business, instead trying to compete based on analog foundations in a digital world. AI-driven digital will yield competitive advantage, improve customer experience, and reduce cost through strategic automation. However, despite the promise of AI, most enterprises will struggle to succeed with AI. One of the greatest challenges in becoming a digital enterprise is that data in “analog organizations” is siloed across hundreds of systems – each representing a semi-autonomous non-collaborating business or technical silo of the organization – with conflicting views on what the business reality is. This data resides in ERP systems, data warehouses, data marts, data lakes, databases, and file systems that are not connected, not to mention AI-enabled. The problem for companies is that they waste significant energy and time combining, enriching, cleaning, verifying, and organizing the data to get it ready for modeling rather than doing the modeling itself. Analog organizations will spend more time rationalizing conflicting views of the business than delivering business value. Unite your data with AI to transform your business and revolutionize your industry instead. Siloed units within organizations are not going to disappear. However, with separation of storage and compute, it is now possible to have a single repository of organizational knowledge that is distilled/acted upon to serve a specific business unit or purpose without affecting another. This new standard allows AI to run with greater fidelity and accuracy and it drastically lowers the cost of data management while allowing for significant acceleration in delivering AI outcomes. Unified analytics (UA) makes it easier for enterprises to build data pipelines to connect the complex siloed data networks that exist in most organizations and label datasets for data science, allowing for centers of gravity of data to solve multiple business problems for multiple organizations without spending energies rationalizing these perspectives. UA also provides access to a broad set of AI algorithms that previously existed within organizational silos, never to be shared. UA is an easy way for a digital organization to light up AI for the various stakeholders, allowing them to collaborate on data and algorithms without having to resort to “old-fashioned-governance.” In fact, UA allows governance without requiring fundamental, hard-to-implement changes to an organizations culture. It combines the power of cross-domain data with white gloved service tailored to each unit. Databricks’ Unified Analytics Platform, powered by Apache Spark™ , lowers the barrier for enterprises to innovate with AI and accelerates their innovation. This managed cloud service auto-scales Apache Spark clusters and includes an enhanced version of Apache Spark that is up to 50 times faster. It adds data reliability to exploratory data stored in cloud data lakes, making it much faster and more reliable to build complex data pipelines at massive scale (prepare petabytes of historical data with real-time data) for AI. Databricks’ collaborative notebooks are tightly integrated with cloud-native Apache Spark clusters and enable data scientists to productively execute their complete AI lifecycle, and explore large datasets and AI applications data through simple SQL queries, advanced analytics in R and Python, or to build predictive models using machine learning/deep learning. It’s the best-in-class collaborative platform that truly unifies data science and data engineering for fast iterations of data preparation, model training, and production deployment. Databricks’ customers also benefit from data security, compliance, and reduced DevOps costs. As a result, organizations can finally apply AI across their data and drive disruptive innovations to the market. Capgemini and Databricks leverage their years of big data and Apache Spark experience to solve the siloed data store/siloed data lake problem using UA. UA allows high-fidelity, high-precision, high-speed analytics on rich, wide, high-dimensional data sets without requiring all business units to compromise on their individual goals or priorities or timelines. Purpose-specific Databricks serverless compute units are the heart of value creation within Capgemini’s Modern Digital Estate for AI. The serverless ability to quickly spin up, automatically scale up, scale down and quickly tear down a cluster is one of the key reasons Capgemini selected Databricks as a premier partner for the Modern Digital Estate for AI. The additional advantage of Databricks is its support of multiple workloads including ETL, SQL, real-time streaming, ML/DL, and graph, as well as support for a wide range of popular data science libraries including TensorFlow, CNTK, MXNet, PyTorch, R and SciKit-Learn. With the general availability of Databricks on Azure, Amazon, and for Edge/on-premises use cases, Databricks is quickly becoming the de-facto Apache Spark engine for many of Capgemini’s AI, Analytic and big data projects. Capgemini and Databricks are quickly collaborating with ecosystem providers in the AI, analytics, data management, master data and other spaces to increase the number of partners that can work on the Modern Digital Estate for AI with Databricks. Why work with Capgemini and Databricks? Capgemini is a market leader in AI, analytics and data strategies and implementations. Clients have worked with Capgemini to not only evolve their analytics architectures to exploit massive data volumes and new data types, but also to embark on new and innovative projects that transform their industries. Databricks’ founders started the Apache Spark research project that later became Apache Spark at UC Berkeley. With Databricks, they provide a Unified Analytics Platform powered by Apache Spark for data science teams to collaborate with data engineering and lines of business to build data products. Users achieve faster time-to-value with Databricks by creating analytic workflows that go from ETL and interactive exploration to production. Together, Capgemini and Databricks help enterprises to unify data and AI to accelerate innovation. The Databricks Unified Analytics Platform, implemented by the seasoned experts and strategic visionaries at Capgemini, is a powerful way to bring data and AI together to transform your business. Contact Us and know about the Modern Digital Estate for AI and how it can work for your enterprise.